Not too long ago, we dined at Milo & Olive in Santa Monica for breakfast prior to heading to the airport for a quick weekend trip out of town. We loved the food and the atmosphere and knew we needed to go back again in the future. While breakfast was fantastic, they are also known for their lunch and dinner service, especially dishes made using their wood burning oven. If we thought that the breakfast pizza was fantastic, their savory lunch and dinner pizzas are supposed to be just as good, if not better. So, one Saturday morning, we opted to head out to Santa Monica in the late morning hour to see if we could grab a seat at the restaurant right at the beginning of lunch service. Milo & Olive is always busy, no matter what time of morning, day or night you go. As the seating is first come, first serve, it’s important to time your visit just right, or else you may be waiting for a while to get a seat. Luckily, my husband and I arrived at Milo & Olive right at the end of breakfast service and the beginning of breakfast service. The breakfast crowd was just leaving and the lunch crowd hadn’t yet arrived, so there were a few empty seats. At the end of the counter separating the dining area from the open kitchen there were a couple of open seats, and the host asked if we would want to take counter seats. We later discovered that these counter seats were, for us, the only seats we’d ever want when we come to Milo & Olive. The seats are comfortable and provide you enough room and privacy, but you also get a front row seat to all the action in the kitchen. You can watch all the different cooks at all the different stations preparing all the of the dishes as the orders come in. Sitting right at the end of the counter, we were situated right in front of where the head chef for the day was stationed, so we were able to watch as she put the finishing touches on each and every single dish that was sent out to guests and as she controlled the ebb and flow of all the other sous chefs in the kitchen. It was fascinating and entertaining. 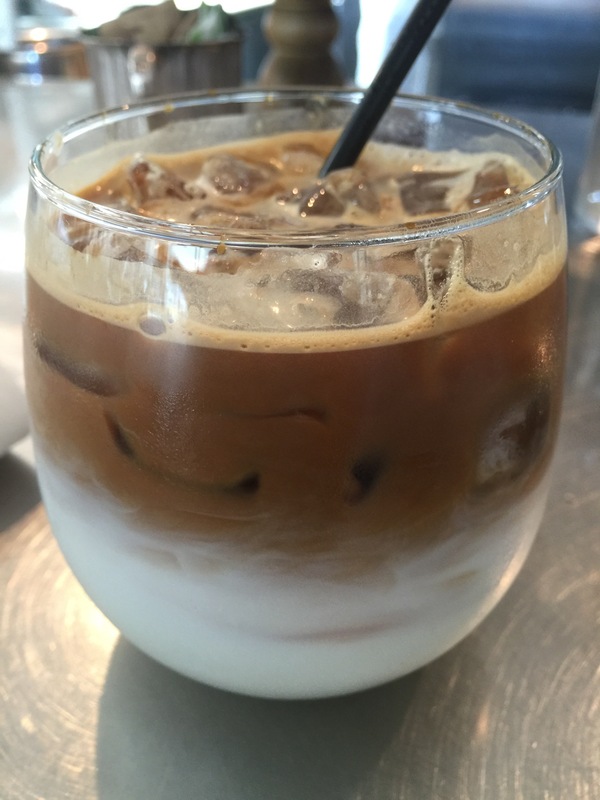 If you read this blog, then you know that I’m a huge fan of lattes. Since we arrived in the late morning, I decided to order an iced vanilla latte to drink. It was warm enough outside to justify an iced coffee drink, and late enough in the day that I didn’t want a hot vanilla latte. This gorgeous drink was as tasty as it was pretty. 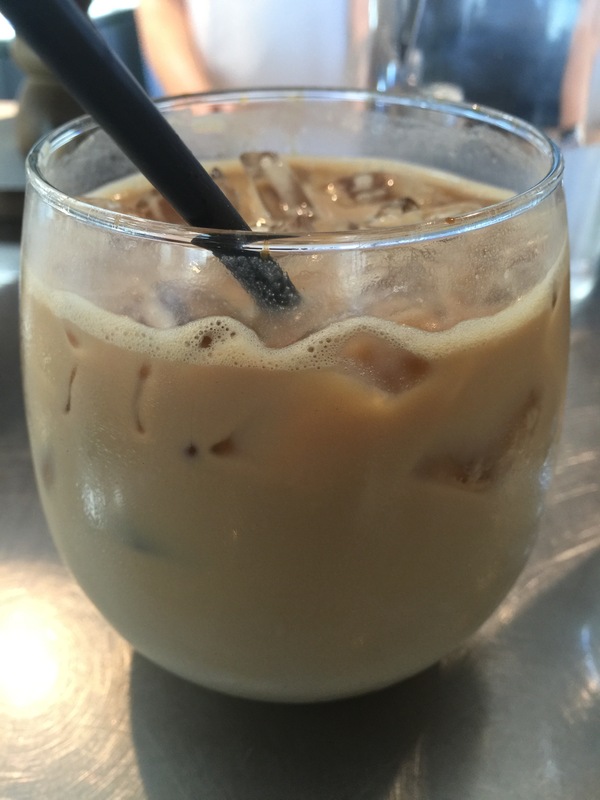 A shot of espresso over milk with some vanilla syrup in a glass full of ice, the perfect iced vanilla latte. On a warm summer day, this drink was the perfect drink for a brunch or early lunch meal. We decided to start our meal with a bowl of soup to share. Really, it was me who wanted the soup and my husband who said to order it as he’d share some with me. However, in the end, I think he had one spoonful and I actually ate the whole bowl of soup on my own, but that was fine by me as it was absolutely delicious. 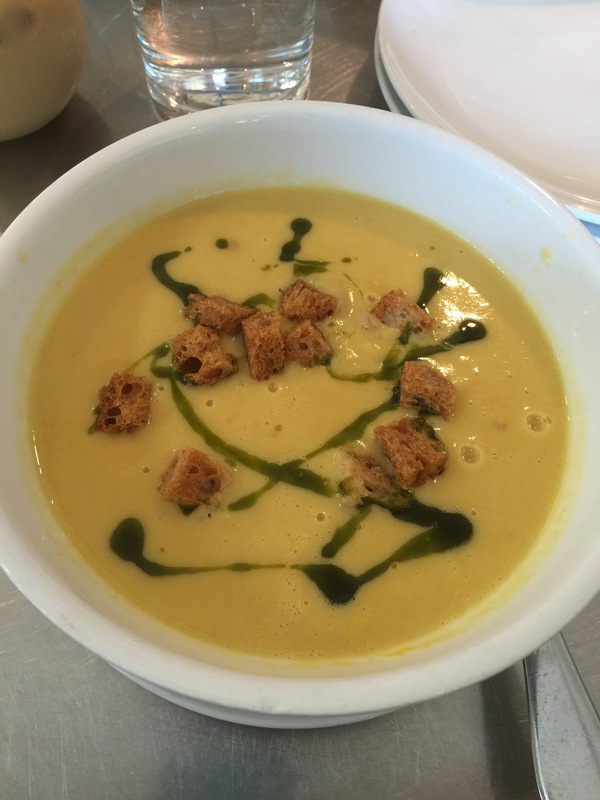 The soup was a Dwelley Farms sweet corn bisque finished off with basil oil and rustic croutons. The sweet corn was so smooth and creamy with a brilliant corn flavor. It just tasted fresh, like the corn just came from the farm. The basil oil as a finisher was a terrific combination, the bright herbaceous flavor of the basil combined with the corn bisque. At first I wasn’t quite sure about the basil as basil and corn don’t seem to be a winning combination, but it just worked in this case. The flavors were complimentary and the basil helped to enhance the sweetness of the corn. The rustic croutons were fabulous and added the crunch and crispiness that the soup needed with its smooth, creamy texture. This corn soup has to rank as one of the best corn soups I’ve ever tasted. One of Milo & Olive’s specialties is the garlic knot. This is the one item I really wanted to try the first time we came to Milo & Olive but wasn’t able to because we were there for breakfast, and the garlic knot isn’t served until after 11 am when the lunch menu becomes available. 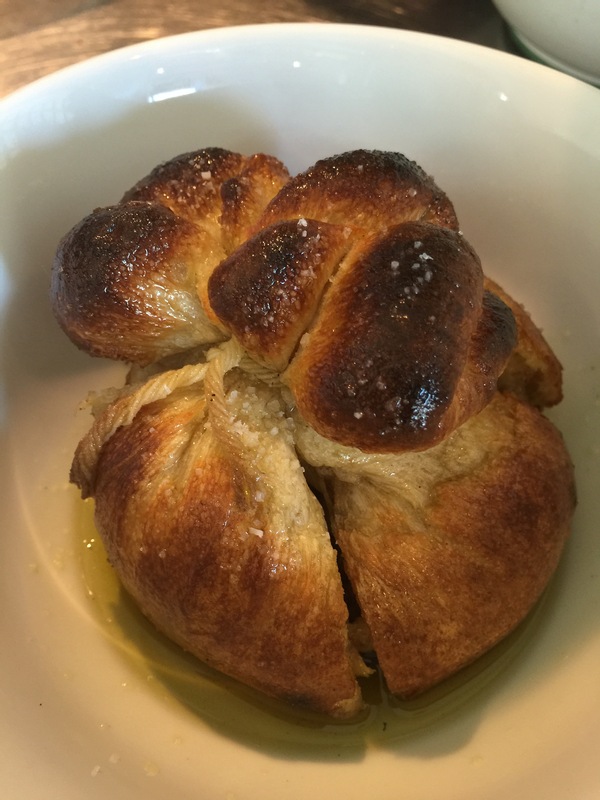 The garlic knot is made in the wood burning oven and it’s cooked to order. The fresh dough is stuffed with a handful of whole garlic cloves marinated in olive oil. The dough is tied with some twine to form a bag of sorts and then baked in the wood burning oven. When the dough is fully baked, it is transferred into a bowl with a little bit of extra virgin olive oil and topped with sea salt and then presented at the table. When you crack open the knot, the hot aroma of roasted garlic cloves hits your nose. The bread itself is amazing and tastes fabulous. Golden brown and crunchy on the outside and yeasty on the inside, take a pinch of bread with a clove of garlic and this dish is magic. For anyone who loves garlic, and my husband and I count in that crowd, this garlic knot is a “must”. Again, since this is Milo & Olive, we had to take advantage of the wood burning oven to order a pizza. This time, we opted for the roasted potato pizza topped with rosemary cream, caramelized onions and parmesan cheese. We then had the pizza topped with prosciutto, which was just heavenly. First off, you don’t even need to top the pizza off with any sort of meat or protein as the roasted potato pizza on its own would have been decadent and filling enough. 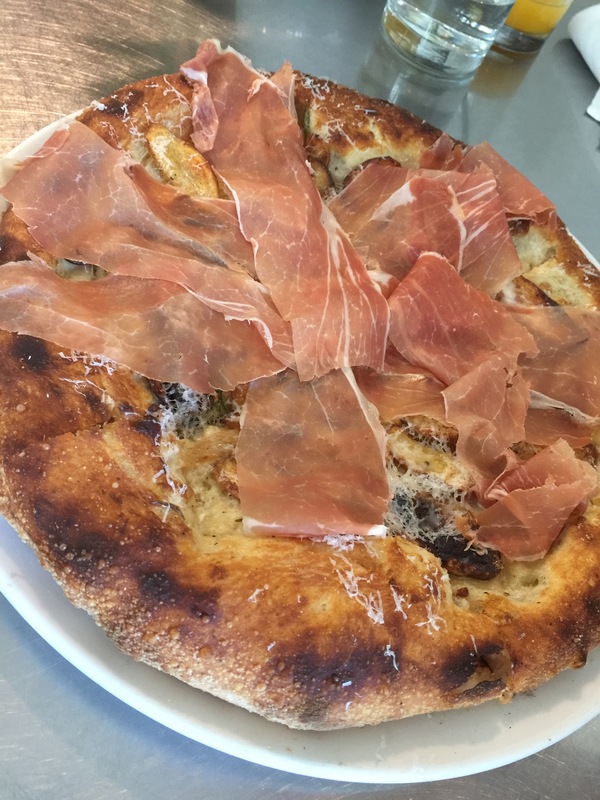 But, by adding the prosciutto, we added that slight hint of saltiness from the dry cured meat that just took the pizza to a whole new level of perfection. The rosemary cream sauce for the pizza was delicious, it kept the pizza from tasting dry, and the woodsy flavor of the rosemary really shined through. The caramelized onions and the roasted potatoes were plentiful, and also evenly spread out throughout the pizza so that with every bite you got a little taste of the onions and the potatoes. I loved that the potatoes were tender and full of starchy flavor of their own, that combined well with the sweetness that caramelizing the onions brings out. Top that with the salty prosciutto and you’ve got sweet, salty, savory and creamy all in one perfect pizza. And you can’t discount the amazing dough and what the wood burning oven does to the dish. The dough came out perfectly baked with golden brown and crispy edges that just spelled pizza perfection. 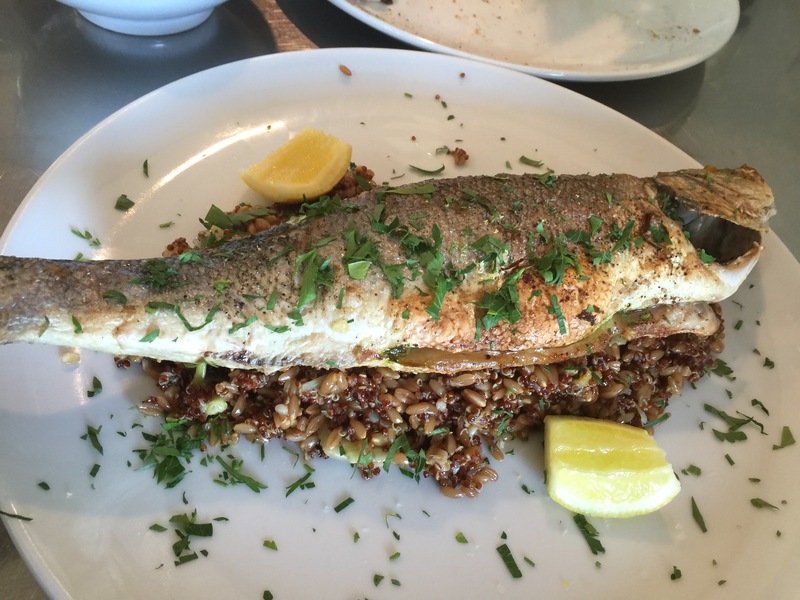 Finally, also from the wood burning oven, we ordered the whole branzino. And when they say whole, they really do mean whole. Gutted and seasoned, the whole branding goes into the wood burning oven to roast until the meat is cooked and fork tender, but the outside skin is nice and crispy and a warm oven roasted brown. The fish is served over a sautéed mixture of grains, caramelized fennel and then topped with fresh herbs and served with a couple of lemon wedges. Squeeze the lemon wedges all over the branzino and dig in. The first thing I notice is how crispy the skin is and how tasty and sweet the meat of the branzino was. And as advertised this was a whole branzino, and we’re not talking about a small little fish, this was an extremely large fish that was just slightly bigger than this huge 10″ round dinner plate it was served on. It was so large that when we couldn’t finish the fish for lunch, it was packed up in a pizza box for us to take home. The meat was so incredibly fork tender and so amazingly delicious. You could definitely taste the smoky flavor that only comes from the wood burning oven. The contrast of the sweet and tender white fish and the crisp and crunchy skin was just magical. And while the grains and caramelized fennel salad that it sat atop was a terrific complement to the fish, it was also completely unnecessary because all I cared about was the fish. This may be my favorite branzino dish ever. What we couldn’t finish while dining in at Milo & Olive, I completely devoured later that afternoon when we brought it home. Lunch at Milo & Olive didn’t disappoint at all. We already knew that the food would be fresh, and delicious and seasonal since we had dined there before for breakfast, but now after having had lunch at Milo & Olive, I think that perhaps my lunch is my favorite meal there. Starting with the amazing sweet corn bisque to the ridiculously tasty garlic knot, the perfectly done roasted potato pizza and finishing it all off with the most amazing branzino ever, Milo & Olive is just spectacular. I think our enjoyment was also heightened by our front row seats right at the counter watching the amazing work of the chefs as they prepared every single dish to order. It was such a fun atmosphere for a Saturday morning, not to mention the delicious food that filled our bellies. I can’t wait to go back to Milo & Olive again and try whatever new seasonal items might be on their menu.